Made in Spain. Loved worldwide. “Since the dawn of time the human race has always had a need for stuff, and a means to carry that stuff around. Over the millenniums various container styles were developed, from earthen bowls to wooden dugouts to modern steel and plastic containers. All functional, but still lacking. Until now. Behold the pinnacle of container design— Tubtrugs®! Not only can a Tubtrug® do anything its predecessors can, it does so much more. Its flexible design, super-sturdy construction and range of sizes make it arguably the most usefool tool in the world. 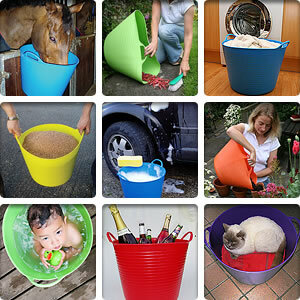 Tubtrugs®—Use Them For Everything! Used by professionals the World over, Tubtrugs® are build to last—two extremely strong handles and flexible body make handling a Tubtrug® much easier than any average bucket or tub. Often imitated but not the same, Tubtrugs will be back this year. Look for them in the foyer with the gardening books and seeds. 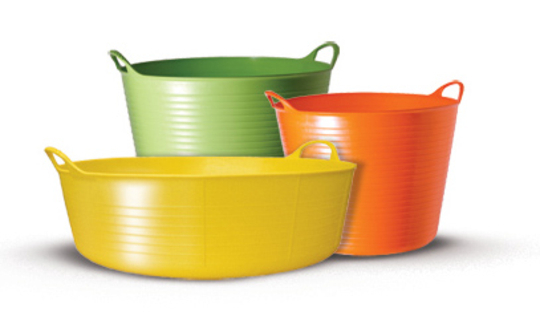 There are new sizes and still thousands of ways to use Tubtrugs.